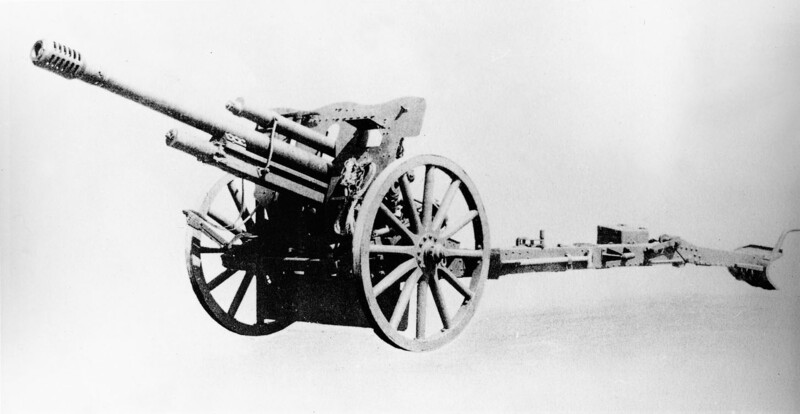 A piece of light field artillery used by the German Army only to a limited degree, the 7.5cm Feldkanone 38 was based on a design created and manufactured by the arms manufacturer Krupp in response to an order from the Brazilian Army, which received 64 such equipments with six-baffle muzzle brakes and large-diameter spoked wooden wheels inside steel tyres (as shown). During 1942 the Germany Army found itself in need of substantially larger quantities of more modern field artillery, largely to satisfy its needs on the Eastern Front against the masses of Soviet manpower and hardware, and as a result Krupp adapted its Brazilian design to create the 7.5cm Feldkanone 38 that was built to provide a partial replacement for the obsolete 7.5cm leichte Feldkanone, a Krupp weapon that entered service in 1931 and reflected World War I artillery thinking rather than the requirements of modern mobile warfare as was being practised over the vast distances on the Eastern Front. Features of the FK 38 were trail legs that were heavier and larger than those of the Brazilian weapon as well as a two-baffle muzzle brake and typically solid German wheels or steel construction with sold rubber types. Like most pieces of German field artillery, the FK 38 fired fixed (one-piece) ammunition.